This paste has a unique texture with a soft consistency which means that it can be fished with confidence on a pole, waggler or feeder. The bait is still really soft and fluffy and easily presented at distances of over 60 yards. Normally if paste is fished on a rod it has to be made so stiff so that it will stay on for the force of the cast, this then means that the hook will not pull through therefore making hooking the fish more difficult. Once you have mixed the paste make it into a ball and just tear a pinch off and simply hook it on, it does not need to be moulded, this way it leaves a rough edged paste unlike any other. Once it is in the water small particles of the paste begin to fall away enticing fish to feed, this also feeds the swim. Use larger hooks and heavier line with Fibre Paste as it catches larger than average fish and the larger hook will also help to keep the paste on. 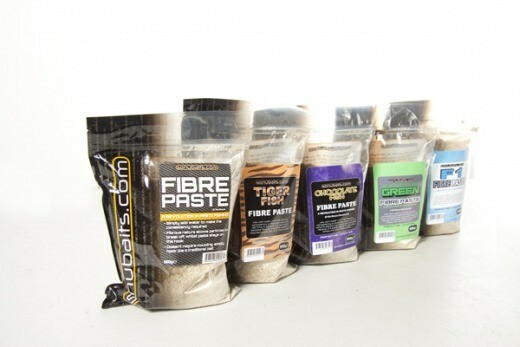 Fibre Paste sinks slowly which means it can be cast on a waggler rod at cruising fish and it will fall slowly giving more time in the feeding zone.